He caused the deaths of hundreds of thousands of people in his attempt to force his will on Europe. He smelled bad, was short, and anti-British. That's enough for me. Pretty uniforms though. I'm sorry, Bill. This is a ridiculous premise. He was fighting against all of the other European Powers from forming the European Union 200 years early and having to file for bankruptcy! Sorry is that to political? I think he may have kicked a dog once, apart from that he was a good egg. "-If I'm not mistaken he started several wars"
he might have had very disturbing policies for European powers (continental blockade being one of them, making Kings as in Spain, and many others, mainly economical), but technically he only started the Russian war. Even then, that is slightly arguable as Russia had joined a coalition with England and Napoleon decided to strike first. one can only be happy that Imperialist France didn't rule Europe any longer. Having said that, European powers made Napoleon's military fame by initiating war against France again and again and again, from the Revolutionary days till the 100 days. - placing his relatives at the head of new states. - imposing a ruler to Spain that lead to the Guerilla. - economically transform neighbour countries into satellites. - forcing everyone into continental blockade (though that was his only weapon to weaken Britain, Britain that would not make peace in any circumstance). Conscription of children into the army. He was an ogre and ate children. He not only reestablished slavery within the French Empire, but reenslaved those blacks who had been freed by the Revolution. He was an ogre from Corsica. There is nothing more galling for the Brits than having a marvellous heroic defeat ruined by the Germans turning up (late! no trains then clearly) & winning the battle for them. Betrayed the Revolution by becoming a dictator, some would say "Emperor". Betrayed the Revolution by the Concordat of 1801 with the Pope. Restored the Gregorian Calander; today is 6 Messidor CXVIII after all. 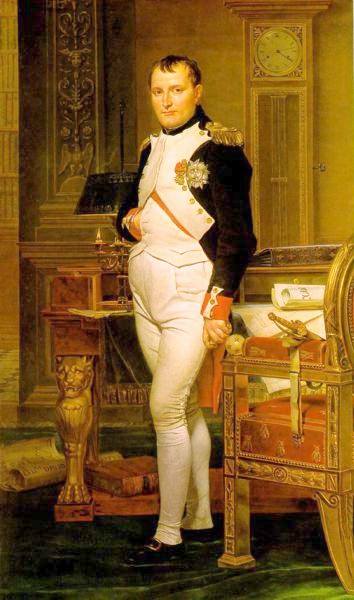 Was incapable of international compromise, see Charles Esdaile "Napoleon's Wars: An International History 1803-15"
Did not respect interantional law, for example the kidnap and murder of the duc d'Enghein. He is labeled evil because the British won the war and labeled him as such! If he was anti-British, he must have been evil! Bill, you are being a trouble maker. Wasn't he the one responsible for the Deepwater Horizon spill? He had a really stupid hat. John, John, John – he wasn't short – he just made the mistake of getting painted beside Old Guard Grenadiers all the time! What was he reaching for? "Well there are the revolutionary points:"
Thank you for noting these! So many people will forgive any enormity, or just look the other way, so long as the bully mouths what they believe is the correct ideology. I really don't think we can make a value judgment for historical figures in cases like this. Also, he apparently inspires lame polls. He makes ordinarily normal people work themselves into irrational frenzies on Naploeniic History and Napoleonic Discussion. Nay, not just frenzies. Tizzies too! His army chefs invented margarine!!! What the OFM didn't say. Obviously the fact that the OFM is a relic of Napoleonic times himself has clouded his judgement in these matters. "He was fighting against all of the other European Powers from forming the European Union 200 years early and having to file for bankruptcy!" I woke up this AM and it hit me, I had it halfassedbackwards. Napoleon "Continental System" was like the "European Union" just 200 years early. Sorry all, see what a decent night sleep will do for you. A selection of 'historians' – who cannot bear to use his imperial title, apparently because self-improvement is a mortal sin to them – need him to be to justify btheir relentlessly pintless meanderings and hand wringing. Because he said "What are the lives of a million men to one such as I"
Wasn't half stuck on himself was he? ..plus he probably took a dive once in soccer!!! He was a megalomaniac who hijacked the revolution. people need to have a nice simplistic view of history with clearcut good guys and bad guys, which lends itself to highly entertaining opinion-based "history" that glosses over the confusing facts and complexities. N is a villain because some people need him to be one. He was a megalomaniac who hijacked this forum.